The market for advanced imaging technology for automotive applications is expected to be worth $7.3 billion by 2021, according to a new report from market research company Yole Développement. The forecast predicts growth of 20 per cent per year between 2015 and 2021; it takes into account visible cameras, solid state lidars, LWIR cameras and 3D cameras. 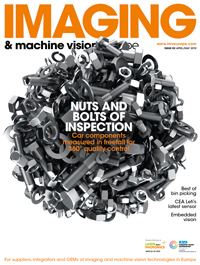 The report - titled 'Imaging technologies for automotive 2016' - found that advanced driver assistance systems (ADAS) will account for 51 per cent of the increased revenue of automotive imaging technology by 2021. More forward-facing ADAS cameras are expected to be installed for autonomous early breaking. LWIR technology is expected to be integrated into ADAS systems in the future for detecting pedestrians and wildlife. New laws being passed in America will make it mandatory for vehicles to have rear-view cameras by 2018. According to Yole, however, this increase in rear-view vision will be dwarfed by a ‘skyrocketing’ uptake of 360° surround view cameras, which enable a bird’s eye view perspective and are used for park-assist applications – a feature fuelling the growth of imaging in the automotive sector. ‘From less than one camera per car on average in 2015, there will be more than three cameras per car by 2021,' stated Pierre Cambou, imaging activity leader at Yole. ‘It means 371 million automotive imaging devices.' This dramatic increase in the number of devices will be most beneficial to companies such as Omnivision, Panasonic and Valeo, who have become major manufacturers of sensors and cameras for automotive applications. Technologies such as mirror replacement cameras and solid-state lidar are expected to be present in a small selection of vehicles by 2021. Cost reduction will be a key factor in their adoption, as it will result in lower manufacturing costs and ultimately lower prices for the vehicles that use them. The use of 3D cameras in the future will be limited to in-cabin infotainment and driver monitoring. This technology will be key for luxury cars.